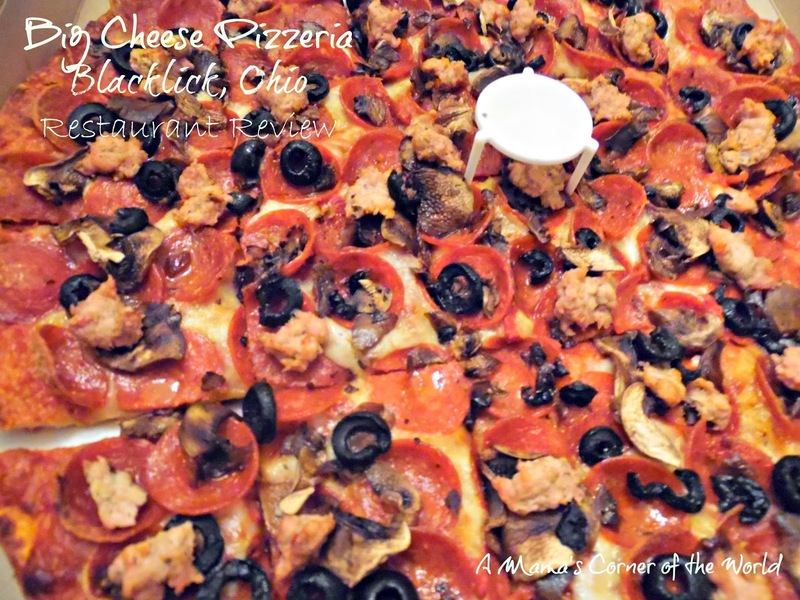 I will admit that we love pizza in our little corner of the world--and Columbus, Ohio has no shortage of pizza places. I am pretty sure that we could try something new every week for years before we tried the same restaurant twice! 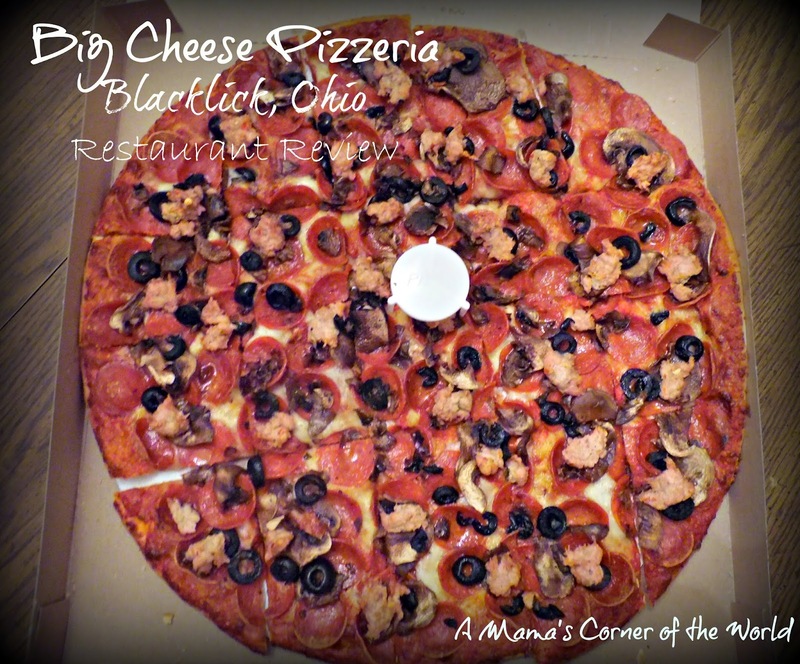 We have heard about Big Cheese Pizzeria in Blacklick--an eastside Columbus suburb--but, never seemed to find the time to try it. While we didn't have time to dine in at the restaurant--we were able to order takeout a few months ago. 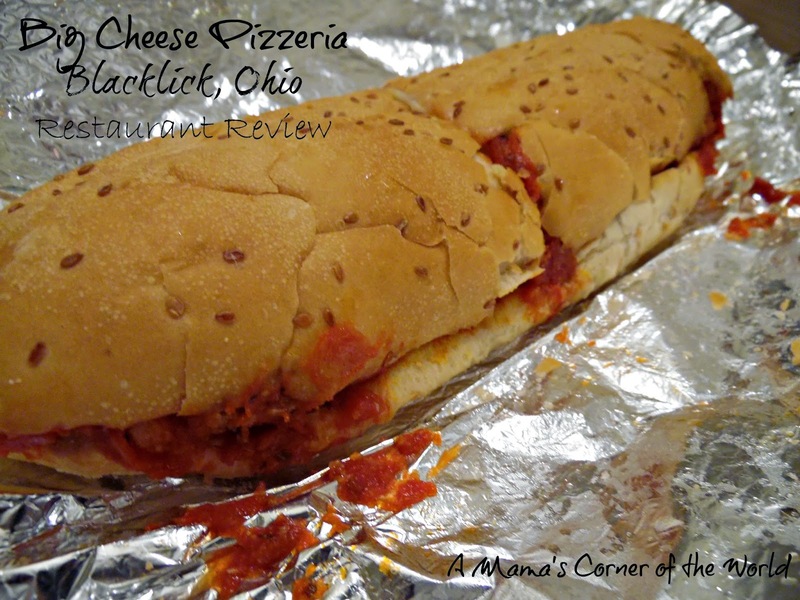 What was our review of Big Cheese Pizzeria in Blacklick, Ohio? Big Cheese Pizzeria has an out-of-the-way location. We had heard of the restaurant--but, could never remember seeing it. There is a reason we've missed it--the restaurant is housed in a small, re-purposed, house--with only a small sign on the front of the building. The Big Cheese Pizzeria sits away from road with a small, gravel parking area and no large sign near the road or fancy decor. Most of the other businesses in the area are warehouses or small offices. We actually had a difficult time locating the restaurant in the dark during our first visit! The parking lot has little lighting and the restaurant sign wasn't lit during our visit. Big Cheese Pizzeria keeps it simple. The restaurant offers a very casual, low key environment. It's a bit dark and dated inside--but, the atmosphere is friendly and simple. The minimal staff is friendly and give the restaurant a small town, welcoming feeling. When we picked up our order (8 pm on a Saturday night), there was one person running the kitchen and one person manning the register and serving the dining room. 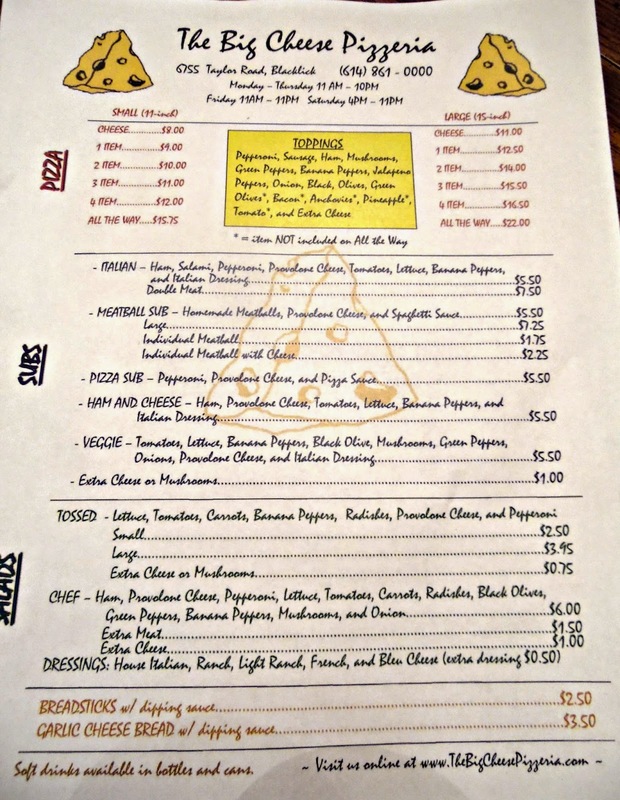 The menu is even quite simple with only pizza, subs, and salads--and pretty basic ingredients. Big Cheese Pizzeria has their own specialties. While the menu is small--Big Cheese Pizzeria makes the most of its offerings. There was a steady stream of carryout orders as we picked up our dinner--and most seemed to be repeat customers greeted by name by the employees. Big Cheese Pizzeria makes their own meatballs, sausage and dough on site--and we were interested in those special items. How was the food at Big Cheese Pizzeria? 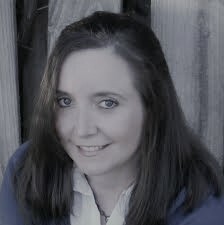 Again--the presentation was a simple, unbranded foil lined sandwich wrapper. There was no question that these meatballs were homemade--by hand. I make meatballs a lot--and generally receive rave reviews for them--but, my meatballs wouldn't stand a chance in competition against these. 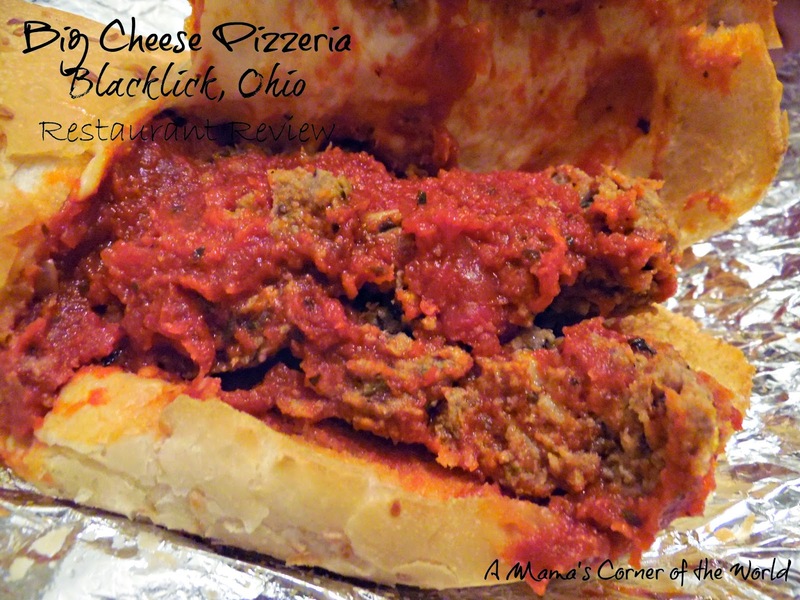 This was truly the best meatball sub that I have ever ordered from a restaurant. What were our final thoughts on Big Cheese Pizzeria? This has quickly become our go-to pizza place in Columbus. The prices were reasonable for the portion size and the quality, the service is wonderful, and I have yet to find anything negative to say about the food. They serve basic pizzas and subs--nothing fancy, nothing exotic. Because the sausage and the meatballs are made on site, in limited quantities, they are frequently sold out by later in the day. I definitely recommend Big Cheese Pizzeria if you are in the neighborhood--and order earlier, rather than later, so that you can try the sausage or meatballs!